The Asagi koi variety is the granddaddy of all modern koi varieties! Among today’s many dazzling varieties of koi, if you were to start moving backwards through time each variety of koi would drop away until you would be left with the Asagi; the grand daddy of today’s koi varieties. Before Asagi, the practice of keeping these fish would have been only Magoi, the wild black carp; a food fish. The timeline of Magoi you could follow back another 20,000 years or so. Magoi, as the Japanese called them, were the same black carp that were cultivated as a food fish and traded throughout Eastern Asia many millennia before koi were ever imagined. Black carp were brought into Japan when the Chinese invaded Japan around 200 BC. Yet the Asagi would not make their appearance until about 160 years ago when the Japanese intentionally bred into these fish some “defects” in coloration that came about; making Asagi the first recognized ornamental carp. And what beautiful defects they were! The Magoi through selective breeding were transformed into Asagi and the transformations have not stopped since. Many koi enthusiasts, hobbyists, even the pros might consider the Asagi a rather mundane type of koi with none of the vibrant colors that today’s koi are known for. While others will argue that the Asagi is one of the most beautiful varieties on the planet! 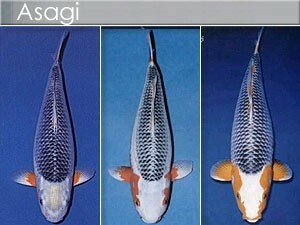 The artwork of the Asagi is certainly more of a technical art than even the mighty Kohaku variety. The Asagi can be recognized by its shade of blue immediately. Asagi is actually the Japanese word for indigo or pale blue. As the koi is observed closer one will see it is a fully scaled fish with an amazing netting type of pattern that the neatly organized scales of this koi create. The scales are a work of art themselves. They are non-metallic, with a pale blue to dark blue appearance, a defined diamond shape, that cover the back of the koi all the way up to its head. The head of the Asagi will be white or very pale blue, with red coloration on the cheeks running back along the belly, to the tail. 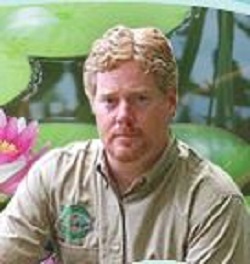 The red coloration should not creep above the lateral line of the fish where it meets that netting pattern of the scales. The pectoral fins will be red as well. The under belly may be white, and the tail of Asagi can be clear or red. For some real artistic detail, the eyes of the Asagi will have red coloration around them. A show quality Asagi is simply a stunning fish. 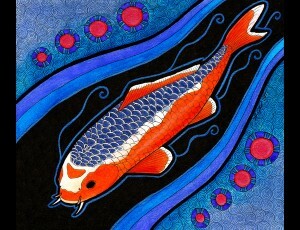 The more one looks at it, the more complex its artwork becomes; and the easier it is to fall in love with the “original” koi. Given the fact that Asagi are capable of getting very large also make this variety very desirable. The larger body size is also something to consider when choosing an Asagi, the conformity of the fish is very important in all varieties and especially with Asagi. The Asagi are said to be easy to breed making them a great choice for beginner breeders and hobbyists who want to experience the enjoyment of raising baby koi. There are some sub-classifications of Asagi, but they are all typically referred to as Asagi. Asagi Konjo are very dark Asagi to the point of having a black appearance. The Asagi Mizu are light blue in coloration and may not have any red at all. The Asagi Narumi are light blue with red. Some say the red came from cross breeding with Kohaku, while others state that the red came from original mutations of the Magoi. Asagi can also be found as a mostly scaleless variety with rows of large mirrored scales running the length of the fish, these are called Shusui; and is a pretty unmistakable fish. There are also butterfly variety with elongated fins and tail and the Gin Rin variety with scales that shimmer and sparkle in the sun; another very impressive work of art! All the Asagi are easy to care for. 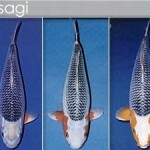 Asagi accept typical pellet food; but a high quality koi food is always recommended. They get along just fine with all other variety of koi. They will add amazing beauty to any koi collection, and become a long term addition to the family when care for correctly. Keeping the Asagi is keeping koi history alive, it is a connection to another point in history, as well as a joy to behold today. As the Nishikigoi hobby heads toward its 200 year mark it is nice to know that the variety that started it all is still with us and breeding strong. Long live the Asagi!